At //SEIBERT/MEDIA, we've been working on a wiki for years. Through our day-to-day work as well as through dozens of enterprise wiki projects, we have experienced - thanks to innumerable different cases - how useful and valuable a wiki can be on a number of levels. Therefore, we believe it is high time to compress the arguments for a wiki into the limited space offered by tweets to make our points as efficiently as possible. An enterprise wiki lends more transparency to all of your company’s processes. A wiki enables the depicting of all of your company’s know-how in a central location. Enterprise wikis have been around since 1998. There are many well-known, mature and established solutions to choose from. 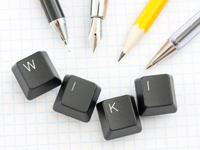 Wikis help companies centralize and systematize scattered information. The knowledge of every single employee is valuable. A wiki helps everyone take advantage of that knowledge. A wiki enables employees to collaborate on the company’s communication and information. An enterprise wiki frees up employee resources, leading to more productivity in your company. Wikis have an excellent ROI thanks to increased efficiency and productivity. With an enterprise wiki, employees can actively contribute ideas to the company. An enterprise wiki offers a completely personalized user experience. An enterprise wiki opens up new and more efficient ways to collaborate. Introducing a wiki into the company shows the employees that they are trusted by management. Using a wiki can significantly reduce the flood of e-mails in your company. Collaboration within the enterprise wiki strengthens team spirit. Everyone makes mistakes. In the wiki employees can proactively correct mistakes in other employees’ content. Productivity is increased every time an employee can find a piece of information in the wiki without needing to ask a colleague. Employees can become recognized as experts through their contributions to the wiki. A wiki introduces a culture of openness into the company, which is motivating for employees. A wiki symbolizes “communication on equal terms” - an important, identify-forming “soft fact”. An enterprise wiki enables the company’s employees to be linked together. An enterprise wiki allows employees to participate more individually and proactively within the company. Wikis often find knowledge gaps and establish themselves as a good reference source without being redundant. Enterprise wikis have been shown to help employees express themselves more successfully. Enterprise wikis have been shown to lend credence to company information. Many iterations lead to high quality content. Wiki documents undergo a high number of iterations. Enterprise wikis have wide market recognition. Those without wikis are at a competitive disadvantage. Wiki users say that they have won more respect within their company by sharing their knowledge. Wikis have passed the test. According to Gartner Hype Cycle, they are on the “level of productive use”. A wiki is the dynamic counterpart to a static intranet suffering from “One Administrator’s Syndrome”. Company knowledge grows organically and quickly within a wiki as all detours through administrators have been removed. Well-developed wikis are ready for the future as they are quickly being further developed with frequent updates. Valuable knowledge is retained in the wiki, even when employees leave the company. Within a wiki, documents as well as whole areas can be assigned for constant updates. With an enterprise wiki, it is possible to prepare much more thoroughly for vacationing employees. Repeated questions can be avoided through the documenting of individual information within the wiki. A wiki can greatly reduce the number of instances when employees need to teach other employees what they know. An enterprise wiki allows employees to collaborate instead of working alone. The wiki allows employees to receive quick input from their colleagues regarding their ideas and concepts. A protected area allows the storing and locating of personal information within the enterprise wiki. It is also theoretically possible to store private information in a protected area of the enterprise wiki. The users themselves decide who will be able to see and edit their content within the enterprise wiki. Using a wiki, experts in each knowledge area can be quickly identified. Using the enterprise wiki, employees can find other employees who can add to their knowledge. Using a wiki, data from other systems can be automatically collected and centrally analyzed. A wiki allows central capacity planning to be done professionally and without the typical e-mail flood. Descriptive charts can be made using the wiki, turning it into a central platform for analysis. Enterprise wikis offer the exporting and importing of MS-Office files. It’s simple to integrate and migrate content. New employees can be productive more quickly if all necessary information for their start can be found in the wiki. Tutorials and directions within the wiki reduce the need for training and support within the company. If an employee is sick, his or her substitute can immediately continue the work where it was left off. Through documentation in the wiki, it is far easier to hand off projects and jump in for other employees. Job descriptions that are kept up-to-date in the wiki save time and money when recruiting. Wikis can be accessed from any internet-capable computer. This greatly simplifies working in virtual teams. Using a wiki, specialized libraries and borrowed work materials, for example, can be effectively managed without a third-party system. Forms for vacation requests, company travel, etc. available through the wiki reduce administrative workloads. A wiki is excellently suited for internal blogs, newsletters, etc. without having to use a third-party system. Wiki-based forms enable web-based solutions that would otherwise have to be accomplished using MS-Access or databases. The weekly cafeteria or meal schedule, sports tip pools, laundry service and other social activities can all be efficiently organized using a wiki. Enterprise wikis allow external communication to be centrally governed and evaluated. A wiki allows employee organizations, such as workers’ councils, to communicate their own information centrally and in a timely fashion. Wikis are independent of specific operating systems. All a wiki needs is a web browser and internet access. Wikis are secure. Access rights can be very finely tuned and can even be adjusted down to specific page levels. Wikis can be used without installing additional software. A wiki has a fully mature API and can be connected easily to existing systems such as MS-Sharepoint. A wiki can be adjusted to fit the corporate design and never seems to be out of place. Wikis can be integrated within the IT-infrastructure using LDAP and single-sign-on. Wikis are very scalable. They work just as well for individual project teams as they do for thousands of users. The code for many wikis is open source, which means many wikis can be adapted to fit individual needs. As opposed to many other systems, wiki templates can be adapted to all requirements. Fully developed enterprise wikis are stable and offer high performance, even when confronted with enormous amounts of data. Wikis keep all options open. For example, data can easily be migrated later into other systems. Thanks to powerful structures for access rights, wikis fulfill the requirements for even the most stringent data protection requirements. In a wiki, project collaborators can access all project information, thus having instant knowledge of the project’s current status. If employees consistently document their work in a wiki, all collaborators are consistently up-to-date. In an enterprise wiki, documents and projects from other areas may also be seen. From project analyses to “lessons learned”, future projects can access and utilize documented experiences saved in a wiki. Contact information saved in a wiki for all collaborators and contact people improves project communication. Systematic project checklists within a wiki can greatly simplify project management. Wikis can import e-mail: Mail exchange for projects is centrally documented. A wiki can be used as a secure extranet, strengthening connections to your customers. A wiki being used as an extranet allows customer integration and enables efficient communication on projects. Requirement specifications noted in an extranet wiki enhance security and help users quickly overcome misunderstandings. Wikis are simple and intuitive to operate. Wikis work just like Word: Open, edit, save. The difference: Wiki documents are available in a central location. Wikis have very good usability. This is why working in a wiki is effective and efficient. Wikis' good usability means the learning curve is easier in comparison to classic intranets. In enterprise wikis, you don’t have to use wiki code like in Wikipedia: There are rich text editors. Wikis' good usability raises user enjoyment. Employees are happy to use the wiki quite often. In a wiki, every change can be followed. It’s impossible to have a higher level of transparency for collaboration. In an enterprise wiki, users can utilize RSS feeds to stay on top of changes without opening a document. Files can be attached to wiki documents that are centrally located and up-to-date. Using WebDAV, office documents can be directly edited within a wiki and are therefore always up-to-date. Using a wiki, events can be efficiently planned, not requiring more than a single e-mail. E-mail communication can be better automated and more efficient using e-mail templates in a wiki. E-mail attachments are stored as various iterations within mailboxes. Wiki documents are always up-to-date. E-mail attachments are stored locally in mailboxes. Wiki contents are available from a central location. Reports created collaboratively in a wiki are high quality and up-to-date, and they can be created faster than by using e-mail. Mistakes in a sent e-mail attachment persist. In a wiki, you can remove mistakes with one click. 2 out of 3 e-mails that employees receive are sent from internal addresses. A wiki helps reduce the e-mail flood. 46% of mails sent via distribution lists to all employees are useless to the recipient. Wikis reduce internal mail. With a wiki, service employees don’t have to answer the same questions over and over again using e-mail. Meeting agendas developed within a wiki are up-to-date and available to everyone without e-mails. If meetings are prepared collaboratively within a wiki, they remain to the point and focused on the essentials. Using a wiki to prepare meetings helps prevent frustrating discussions about topics and principles from popping up in meetings. Whoever misses a meeting can still add input into a wiki as a note, a question, or a comment. Wiki plugins like TaskDock for Confluence allow dynamic task-management without a third-party system. Wiki plugins enable small BI-solutions that can often fulfill the requirements of teams or SMEs. With plugins like the Gliffy-plugin for Confluence, it’s possible to have excellent Visio applications in the wiki. Using wiki plugins, database contents can be integrated into the wiki. They can also be updated dynamically. Scientific studies have shown the usefulness of enterprise wikis. An enterprise wiki isn’t a tool that will solve every single one of your problems. But it’s the next best thing. At this point we stopped collecting reasons, which, naturally, were collaboratively entered into our wiki: The arguments were overwhelming, due not only to their quality but also to their sheer quantity. It should be clear by now that companies that have decided to pass on wikis are robbing themselves of unexpected possibilities and are thus limiting themselves. For these companies, it is truly time to rethink the introduction of a wiki. //SEIBERT/MEDIA would be, of course, happy to support you with vast quantities of know-how in wiki adoption. Please contact us. And if you’re already using a wiki in your company, we would be excited to know what experiences you’ve had and which application cases argue especially strongly for wikis. Would you be able to offer us even more reasons? We’re looking forward to your opinions and comments.